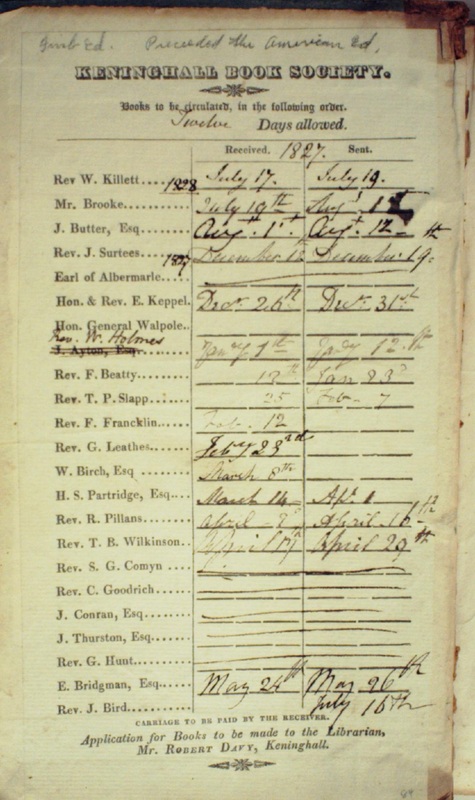 I recently had the great pleasure of assisting a Jane Austen scholar who was looking for book evidence of English circulating libraries during Austen’s lifetime. At first I thought that the assignment would be a piece of cake, since I’d run across a fair amount of 18th and 19th century French subscription library evidence in my music cataloging, as French music publishers of the time often maintained active lending libraries. But soon I discovered that what I had thought would be a straightforward research project would teach me far more about these libraries than I expected. Both circulating libraries, and the more elite subscription libraries, tended to paste paper labels announcing their terms on the front covers, or inside the front covers of their music or books. The label above is typical of those I’d seen so often on French scores: the publisher Cochet clearly ran a subscription library on the side. A lot of new music was initially published in small editions, and popularized by subscription, leading to more publishing as the works became more desirable in the minds of the public. 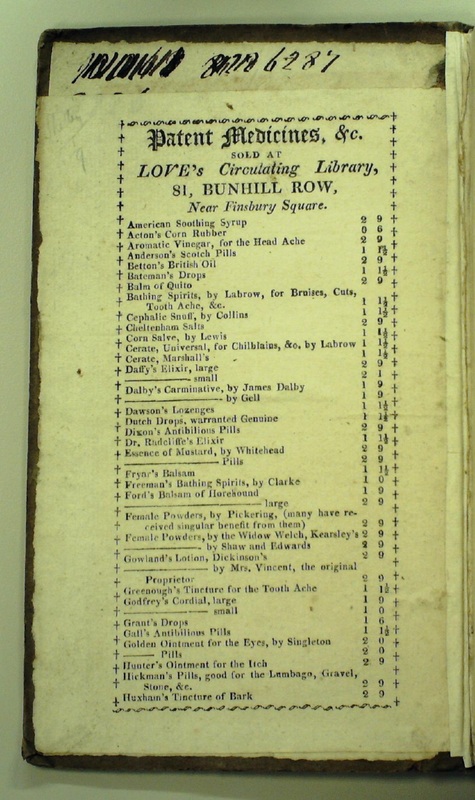 Following a slightly different model, circulating libraries for books were purely a money-making affair, and in England these libraries quickly found an audience in women, many of whom had no access to the kind of money required to purchase books outright. In an attempt to maximize circulation (and therefore, fees) these libraries seized on novels, romances, and theatricals (among others) as books many would not necessarily purchase, but instead read once. I would guess that many in Austen’s day would not have much room in their houses to support a heavy reading habit, either. 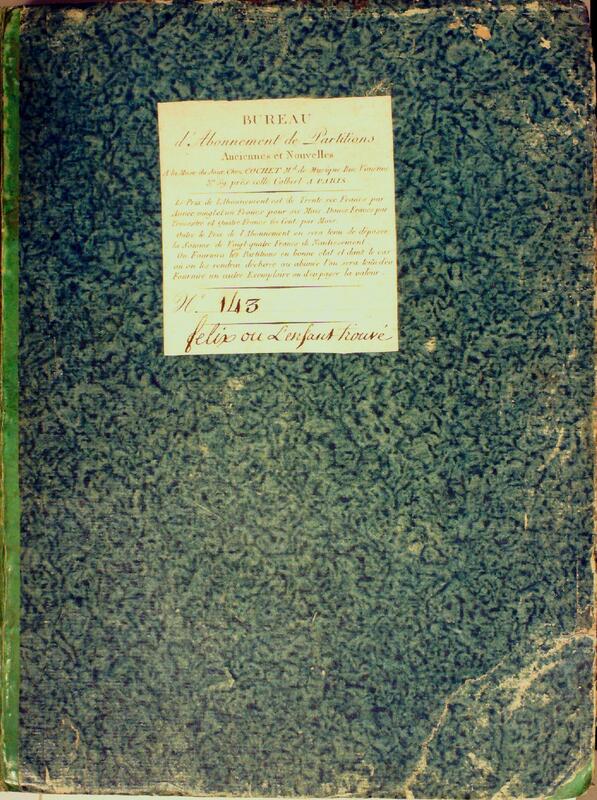 The label above shows the most common label format I found, providing the name of the library, and an exhortation to return the book quickly. 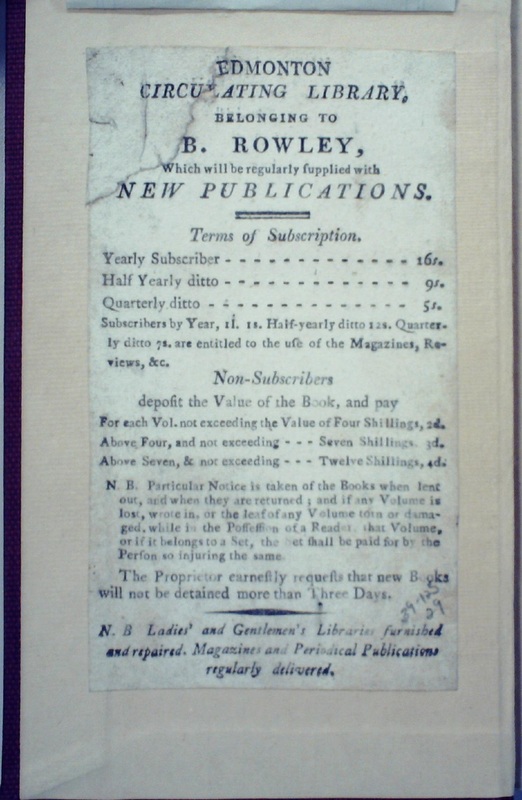 The terms varied from library to library, but all included a yearly fee: a higher subscription fee entitled the reader to more access, as we see above, in that magazines privileges were included for the lucky few who paid more. Additionally, individual fees might be assessed, apparently based on the popularity of the book, and how long it had been part of the library. 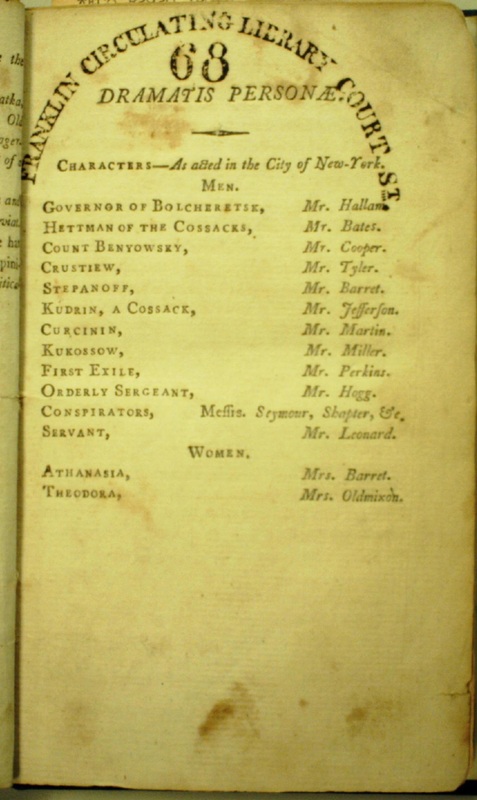 Plays were of course popular for putting on home theatricals. 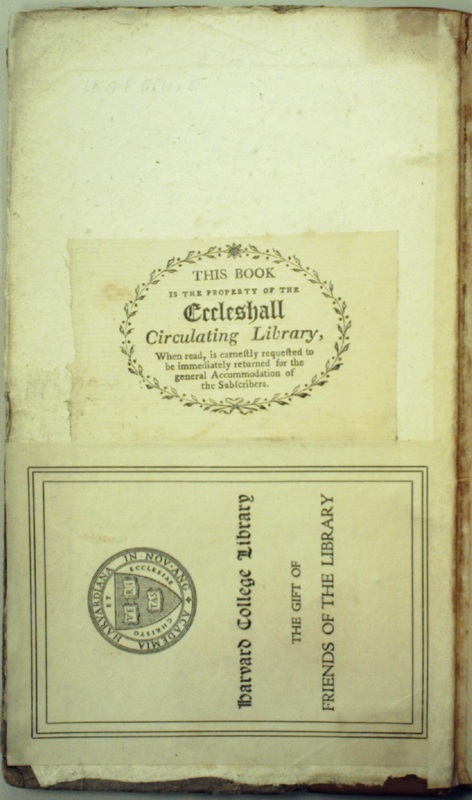 I cannot remember if Austen mentions how the many plays discussed in Mansfield Park were found, but a circulating library would have been one logical place. I do remember that Austen mentions circulating libraries later in Mansfield Park, when Fanny joins one to share her pleasure in reading with her sister Susan. 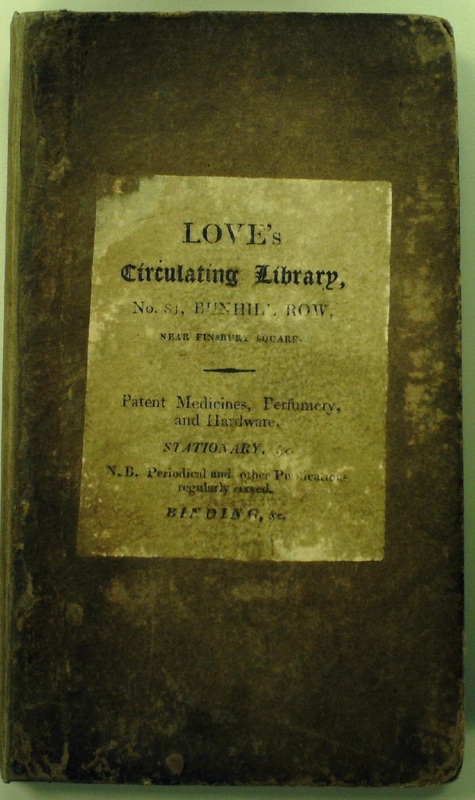 Circulating libraries also stocked other items of interest, and I’m indebted to my friend Jeff Nigro for finding the exact quotation from Pride & Prejudice where Lydia mentions an unusual library use: “… her letters were always long expected, and always very short. Those to her mother contained little else, than that they were just returned from the library, where such and such officers had attended them, and where she had seen such beautiful ornaments as made her quite wild …” Ornaments, from a library? How about patent medicine? But the most fascinating label I discovered, was from a book “society,” which like the subscription music libraries mentioned above was a far more specialized library. From the list of its members, I would guess that religion may have been its focus, but what interested me most was that this book clearly circulated from one to the other, in order of precedence. Ironically, the book in which I found one of these labels was from the library of Harry Elkins Widener, a man less likely to use a circulating library, I can’t imagine. But his love of books certainly rivaled that of the fervent readers who made circulating libraries function, so perhaps it is not so ironic after all. Wishing all of our readers, fervent or not, a most happy Thanksgiving.